A REIT, or Real Estate Investment Trust, is a company that owns, operates or finances income-producing real estate. Established by Congress in 1960 and modeled after mutual funds, REITs provide all Americans the opportunity to invest in large, diversified portfolios of income-producing real estate in the same way they typically would invest in other businesses, buying stock either directly or through mutual funds. More than 70 million Americans invest in REITs through their retirement savings and other investments. The REIT approach to real estate investment has been embraced by more than 35 countries. 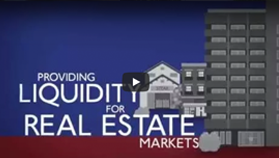 REITs were established by Congress in 1960 and are modeled after mutual funds. Listed REITs have an equity market capitalization of more than $1 trillion. There are nearly 200,000 REIT-owned properties across the U.S. in almost every city. REITs paid out more than $57.5 billion in dividend income in 2017.
mREITs, or Mortgage REITs, provide financing for real estate by purchasing or originating mortgages and mortgage-backed securities (MBS) and earning income from the interest on these investments. Invest in REITs through their retirement savings and other investments. Wherever you go, REITs are all around you. REITs allow anyone to invest in portfolios of large-scale properties the same way they invest in other industries-through the purchase of stock. In the same way shareholders benefit by owning stocks in other corporations, the stockholders of a REIT earn a share of the income produced through real estate investment-without actually having to go out and buy or finance property. Copyright® 2019 by the National Association of Real Estate Investment Trusts (Nareit) Sponsored by the National Association of Real Estate Investment Trusts®, the worldwide representative voice for REITs and listed real estate companies with an interest in U.S. real estate and capital markets. All data is sourced from the “Economic Contribution of REITs in the United States,” EY study sponsored by NAREIT, SNL or NAREIT unless otherwise noted. Boston Properties - Salesforce Tower - San Francisco, Calif. Some of the most iconic office buildings in America are owned by REITs including the Empire State Building, Embarcadero Center and the Prudential Center. Hudson Pacific Properties, Inc. - Rincon Center - San Francisco, Calif.
REITs don’t just own skyscrapers, they also own suburban office towers and office parks across the country. First Potomac Realty Trust -1750 H Street - Washington D.C.
REITs are proactively redeveloping office space to meet the changing needs of today’s workforce. From the Empire State Building to suburban office complexes, REITs own office buildings of all shapes and sizes, providing the space for employees in any industry to get the job done. Even if you work at home or on the road, REIT-owned properties (including hotels, cell towers and data centers) are there to make it possible. REITs own more than 3,900 office buildings. REITs directly employed an estimated 200,000 full-time employees in 2014. REIT-related construction activity in 2014 supported the equivalent of 366,000 full-time jobs in that year. AvalonBay Communities, Inc. - Avalon Bowery Place - New York City, N.Y.
REITs own nearly 18 million acres of U.S. timberlands and provide much of the lumber needed for construction around the world. Camden Property Trust - Camden Denver - West Denver, Colo.
REITs provide best-in-class management and are able to leverage economies of scale to successfully implement tenant-related amenities and technology services. Camden Property Trust - Camden Belmont - Dallas Tex. REITs provide the capital necessary to many universities across the country to meet their housing demand so the universities can focus their capital on education. Renters, students and seniors all have many options when it comes to meeting their housing needs. Regardless of a person’s desired living situation, REITs own and finance a wide array of residential properties to meet those needs. From apartments and single-family home rentals, to student housing and senior living facilities, REITs can provide the perfect location to call home.